Projections show that by 2030 one in three people globally will live in cities with at least half a million inhabitants. Rapid and often unplanned urbanization presents major social, environmental and economic challenges, which are exacerbated by climate change and natural disasters in developed and developing countries alike. There is growing recognition that nature-based solutions can create a more sustainable future for our cities. Nature-based solutions are cost effective mechanisms adapted to local environments that make cities more energy and resource efficient and climate resilient. They also have potential to restore degraded ecosystems, create jobs, reduce poverty, and improve public health, and are a key tool for delivering Sustainable Development Goal 11, which calls for inclusive, safe, resilient, and sustainable cities. 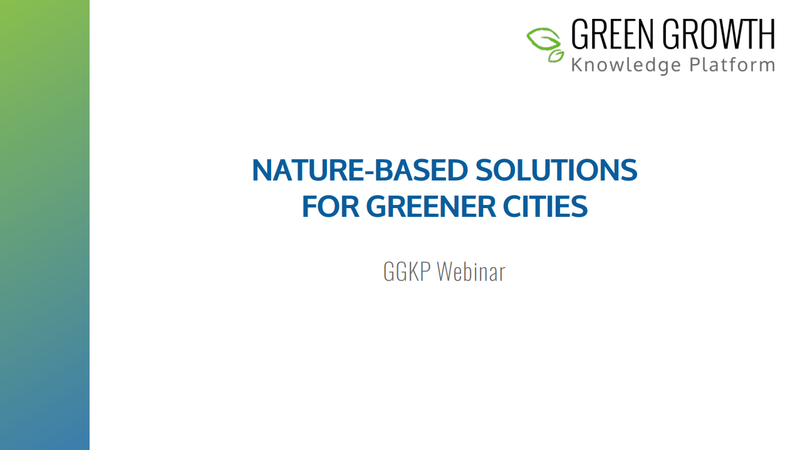 On 31 October 2017 (3:00 PM CEST), the GGKP held a webinar focused on nature-based solutions for greener cities. In this webinar, experts explored how and to what extent cities are adopting nature-based solutions, creating supportive policy frameworks, supporting innovation and citizen engagement, and more. This webinar was held in the lead-up to the GGKP Annual Conference, which focuses on sustainable infrastructure and includes a dedicated session on Co-design, co-development and co-implementation of Nature-Based Solutions for urban resilience. Relevant studies, best practices and tools that can support greener cities and sustainable use of natural capital are available on the GGKP web platform.